In early 2004 a group of friends who met up for regular kick arounds decided to explore the possibility of forming a soccer club that would enter the Mayo League. After a series of meetings with Mayo League officials a evening was proposed for the Community Centre in Partry to gauge the interest in the area. A large crowd attended and a committee was formed, with Vincent Horan as chairman, to formally enter a club to represent the parish in the Mayo League. In the mid eighties a youths soccer club under the name of Partry Athletic briefly operated in the Mayo League for two seasons so a decision was made to revive the name for the modern club. Michael Cronin was appointed as manager and given the task of moulding a group of talented and enthusiastic men into an organised soccer team. Partry formally entered the Mayo League Division 2B in 2004 and in their first match were drawn against Moy Villa. Partry lost 5-1 with Partry's first ever league goal coming from the foot of Ruarigh Gibbons but there were promising signs even in the heavy defeat that Partry could have something special here. Partry next faced the might of Westport United B, a match most neutral observers would have targeted as a walkover for the Westport team, but Partry showed they were learning fast and Westport struggled to win 1-0. Partry's third match though showed they had arrived as they demolished Ballyvary Bluebombers 3-1. Partry went on to finish the season in 3rd just missing out on promotion, a remarkable result. 2005 saw Partry win the Division 2B title losing only twice all season. 2006 and 2007 Partry plied their trade in Division 1 but they still continued their progress appearing in two Tonra cup finals losing both times by the narrowest of margins 1-0. 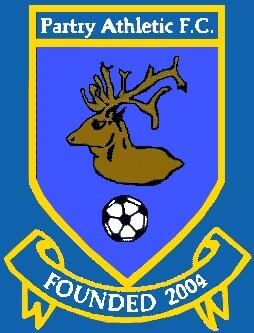 Michael Cronin stepped down as manager in 2008 and Brian and Niell Donnelly took over the mantle. Partry saw promotion in 2008 to the Premier Division. In 2011 Brian and Niell stepped down and Damien McGreal took the mantle. Partry enjoyed a mixed season being relegated from the Premier Division but making the Tuohy Cup final where they lost to Bangor Hibs. For the 2012 season John Moran has taken over the team affairs after Damien McGreal stepped down and he will be ably assisted in his efforts to win promotion from Division 1 by Tom and John Byrne and Ciaran Hennelly. Partry's development has continued both on and off the pitch. The first step was the pitch development, which has left the club with a playing surface that is regarded by many as one of the best in the county, then a fine clubhouse which was opened by the president of the FAI Mr David Blood on the occasion of the FAI visit to Mayo. 2009 saw Partry's first foray into Youths football. Partry fielded a team in the U11, U12 and U14 boys leagues and U14 girls league. The underage development has continued apace in 2010 with Partry fielding U8, U10, U11, U12 boys and girls, U13 boys, U14 boys and girls and U16 boys and girls. 2010 also saw Partry win their first underage trophy as their U14 boys won the Division 4 title winning every game they played along the way. In 2011 Partry won two more titles with the U16's winning the Division 3 title and the U17's winning the Division 2 title. Partry is a village situated on the N84 Ballinrobe to Castlebar road in County Mayo. The pitch is behind the church approx 13 mls from Westport, 12 mls from Castlebar and 6 mls from Ballinrobe.